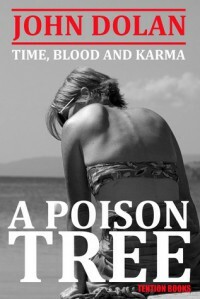 A Poison Tree (Time, Blood and Karma, #3) by John Dolan simply blew me away with the author's wonderful characters and detailed descriptions of family in England leading up to the end of 1999. This book is full of suspicion, Dolan Hitchcock-style - tragedy, Dolan Shakespeare-style - drama, mystery, Dolan Patricia Highsmith-style. The author takes a mundane marriage and shoots a million amps through it, strapped to an electric chair. I particularly enjoyed the opening scene so reminiscent of Patricia Highsmith's Strangers on a Train that sets an underlying tone of deceit, paranoia, mistrust and murder. And this is where we meet sardonic detective David Braddock before he ever thought of becoming sardonic detective David Braddock. Here he is a happily married family man with a boring mundane life as a car salesman. But David's life rapidly unwinds and is far from boring from the moment he meets deranged businessman Jim Fosse who offers him a rather unusual marriage get out clause. The author uses humour to great effect to balance the tragedy and misery interspersed throughout this great mystery novel. Yet again John Dolan has reached new heights of literary excellence and FIVE AWESOME STARS seems not enough. Very highly recommended to all fans of mystery thrillers that do not come too quickly to the boil but rather simmer satisfyingly until cooked.